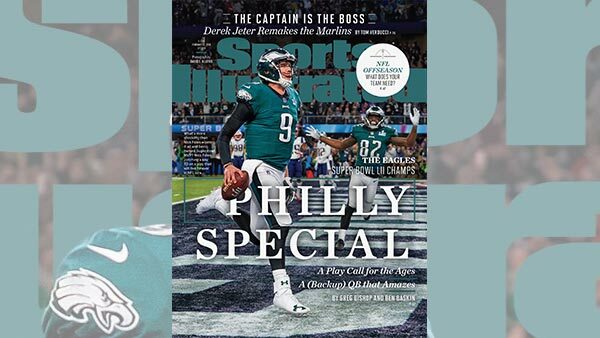 PHILADELPHIA (WPVI) -- The Super Bowl Champion Philadelphia Eagles are the cover story to this week's Sports Illustrated. Quarterback and Super Bowl MVP Nick Foles and wide receiver Torrey Smith grace the cover. The image is of Foles running into the endzone after catching the football to score a touchdown. Audio has emerged from Super Bowl LII that shows Eagles quarterback Nick Foles calling for the "Philly Special," a play that will go down in sports history. Here's how ESPN described the play: "The play called for Foles to move up to the line of scrimmage and basically act as if he's checking his phone. It calls for a direct snap to running back Corey Clement, a pitch to tight end Trey Burton and a pass from Burton to Foles -- assuming the New England Patriots had forgotten about Foles. Which they had, because who would think to cover him?" "You never know what [Pederson is] thinking," Burton said. "Here we are. Philly's never won a Super Bowl. We're fourth-and-1 on the goal line and he calls a trick-play pass to the quarterback? Come on, man." Sports Illustrated called it "A play call for the ages." And they describe Foles as "a (backup) QB that amazes."